Season 1993/94 commenced with the new North Stand at Nene Park, capable of holding 1,000 spectators, fully operational. The Beazer Homes Midland Division title was clinched on May 2nd 1994 in front of 1,504 spectators to achieve a notable double, the side having already won the NFA Hillier Cup six days earlier. The strike partnership of Dale Watkins and Mickey Nuttell had been backed up by a strong defensive unit featuring Kevin Fox, John Flower and Dave Johnson. 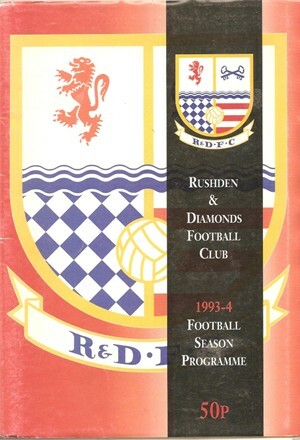 The game at Evesham United on 12th February 1994 was the 100th in the Diamonds History – see here for a reflection on that milestone.